Bad news my friends, I had to disown my children. Yep, all 4 of em. We were talking about favorite foods the other day and I was telling them how I lived off pimento cheese sandwiches when I was little. None of them had ever had pimento cheese! I said,” Hold up, are you serious?” How was it possible that I’d never made them Grandma Fat’s pimento cheese spread? Well turns out I’d missed my window to introduce them to this delight. None of them were particularly whoopy over it. Gosh darnit, I waited too long! Well anyway, no worries. I didn’t kick them out of the house or anything. I just pretend sobbed and told them to go back to their silly minecraft youtube videos and stuffed my face with baguette topped with pimento cheese. Until they hit the stairs. Then I canned the fake sobs, smiled to myself at the peace and quiet, enjoying all the nostalgia that comes with indulging in your favorite childhood snack. 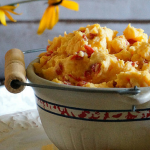 Here’s a true story about pimento cheese. It wasn’t until I was an adult that I realized that 99% of the world’s pimento cheese is made with shredded cheese. Grandma Fat’s isn’t. First time I saw someone else’s pimento cheese I was like what the heck is that? That is not the pimento cheese I’m used to. First time I took my version of pimento cheese somewhere they were like, what is that? That is not the pimento cheese I am used to. We made converts of each other and spread the pimento cheese love around. 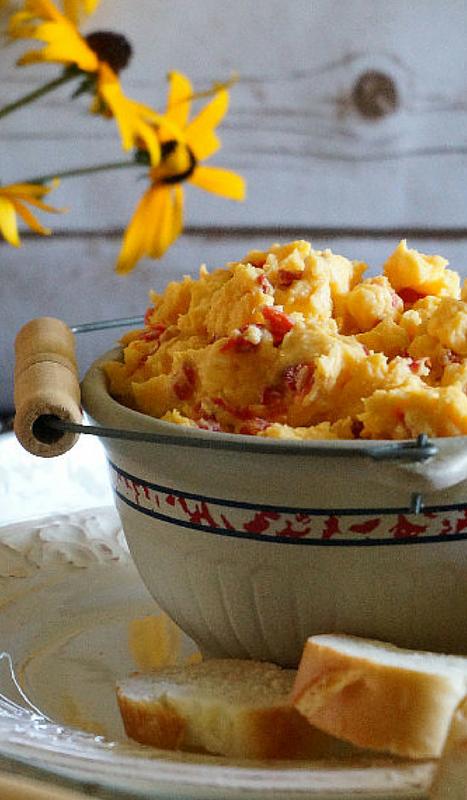 Because people who love pimento cheese are the best kind of people. There is no wrong way to pimento your cheese. Don’t you let anyone tell you different. You don’t need that kind of negativity in your life. 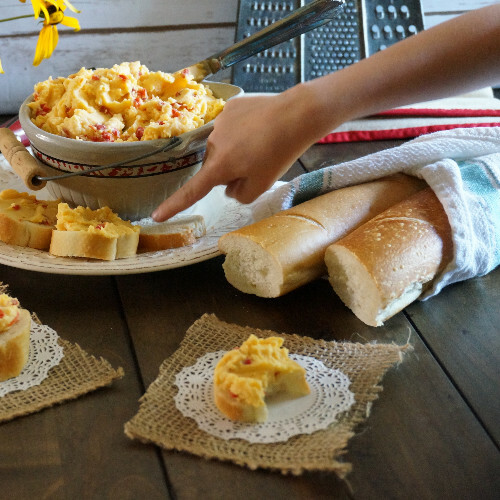 This pimento cheese spread is just that. A spread. It is smooth and velvety and spreadable. It has all the tang and flavor that you’d anticipate with a traditional pimento cheese, just a bit of a different texture. Personally I prefer it over the shredded variety. It’s great as a sandwich spread, on crackers, with veggies to dip in it, stuffed into mini peppers, topping off cheeseburgers.., the possibilities are endless. Remember, there’s no wrong way to pimento your cheese. 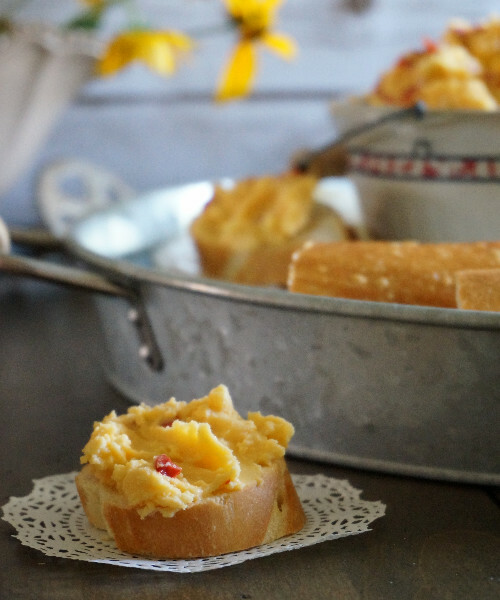 This old fashioned pimento cheese spread is quick and easy, smooth and velvety. In a small saucepan, beat the eggs with a whisk. Add in the sugar and vinegar mixing well. Over medium heat, stirring constantly, cook the egg mixture until it thickens, about 5-7 minutes. Meanwhile place the cubed velveeta into microwave safe bowl. Heat in the microwave until melted and smooth, about 5-7 minutes set at 50% power. Mix together the melted velveeta and the egg mixture. Stir in one jar of drained pimentos. Place in the fridge. The cheese spread will thicken as it cools. 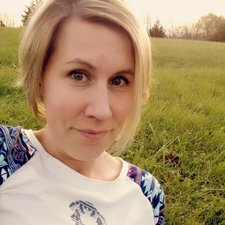 I read this blog to Grandma Fat Amy. She loved it!! That makes my heart happy. Give her a big old hug from me! LOL your poor kids – how could they go so long without having pimento cheese? I haven’t had any in sooo long, but I think it’s about time I change that because this looks too good to pass up! It was one of those, are you kidding me, moments. I mean I loved this stuff growing up, so I couldn’t believe I’d never made it for them. Guess I saving the good stuff for myself. Just like the chocolates I hide under my piles of folded shirts in my dresser drawer! 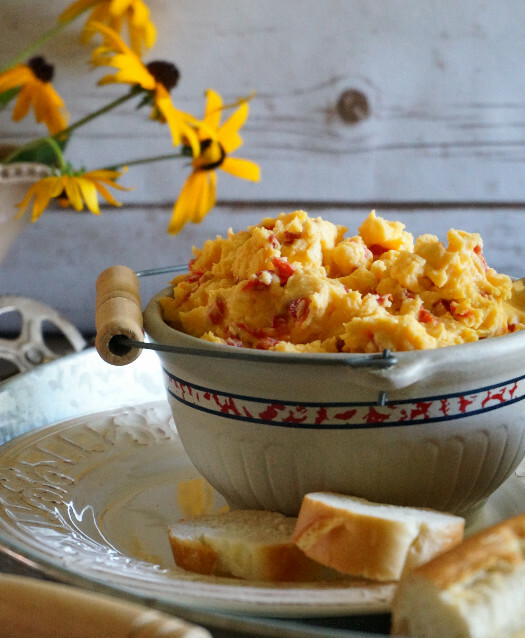 Pimento cheese is one of my favorite snacks! I have a big batch in the fridge right now. Yum! My batch is dwindling, but man I’ve enjoyed it. Hope that you are enjoying yours just as much! What’s your favorite way to eat it? 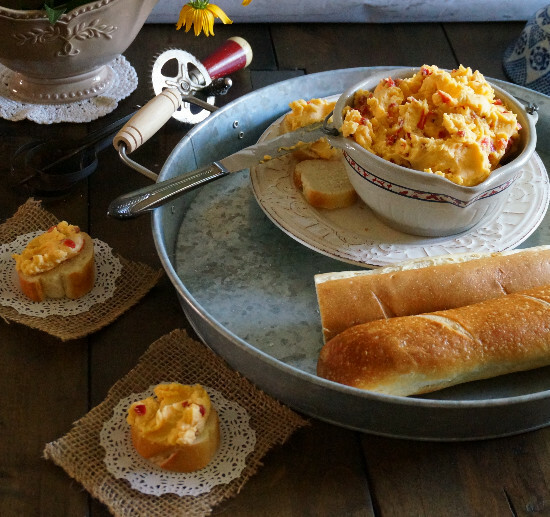 Oh my gosh… my dad was a pimento cheese junkie. He would have gone crazy for this on sandwiches! We had it tonight with our dinner stuffed on celery and a friend was telling me the other day that she’d made grilled pimento cheese sandwiches. It’s hard not to love something so easy and versatile! I just had cheese pimiento with Bangladeshi bread called ruti. 🙂 I love cheese! <3 Thanks for sharing! What fun timing, Nance! What does ruti taste like? I love learning more about other culture’s foods. I think I need to make another batch and take new photos. You’ve inspired me!! 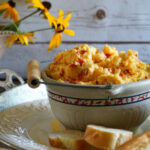 Pimento cheese is one of those things that it seems like there are endless variations of. Everyone’s family recipe seems to be a little different. Thank you for the compliment on the photos. A lot of the items in my photos are actually things that have come from my Grandma’s! I love being able to use their old kitchen items and dishes in my photos. Oh my gosh! This recipe sounds scrumptious! Not the pimento cheese spread I’m used to ( boughten). Gotta say – you are dong a great job with the pictures too,. Thanks Kathie, I really wanted to conjure up the idea of Grandma’s kitchen with these photos. Just bright, cheerful, and country to boot.